Team UCLA leading UC Irvine at Match Race PCCs out of St. Francis Yacht Club, with Transpac 52s Vesper and PowerPlay racing behind them. 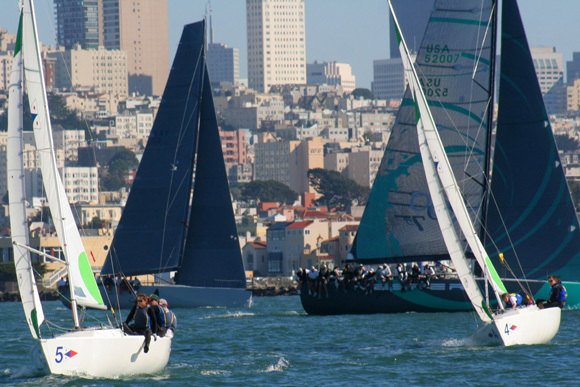 October was a busy month for the UCLA Sailing Team, kicking off the season with two regattas in San Diego and three in the San Francisco area. Highlights include winning A Division at Stoney Burke, taking third at the SDYC Autumn Invitational Match Race Regatta, and snagging a bullet in the first B Division race at Women’s Fall Champs. The biggest highlight, however, might have been the completion of our latest fundraising target, with Ed Feo (’74) making the final donation to push the team past the $7900 they needed. Thank you to everyone who chipped in! Finally, the Stoney Burke regatta tailgate was a big success, with alumni ranging from 1991 to 2011 in attendance. A few alumni will also be showing up for North/South at Santa Barbara on November 12-13, so if you’re free that weekend come out and show your support at the last regatta of 2011!